"It was a discovery about life, a revelation of love as a tragic force, not a melting mood, of passion that drowns like black water." 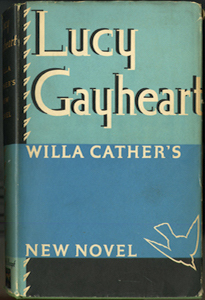 First serialized in five installments in the Woman's Home Companion from March to July, 1935. Published by Alfred A. Knopf on August 1, 1935. Published by Cassell and Company, Ltd. on July 25, 1935. Published by Houghton Mifflin Co. in 1938 in a volume with My Mortal Enemy. Published by University of Nebraska Press in 2015. Historical Essay by David Porter. Explanatory Notes by Kari A. Ronning and David Porter. Textual Essay and Editing by Frederick M. Link and Kari A. Ronning.